Patrick Meier: MatchApp: Next Generation Disaster Response App? MatchApp: Next Generation Disaster Response App? 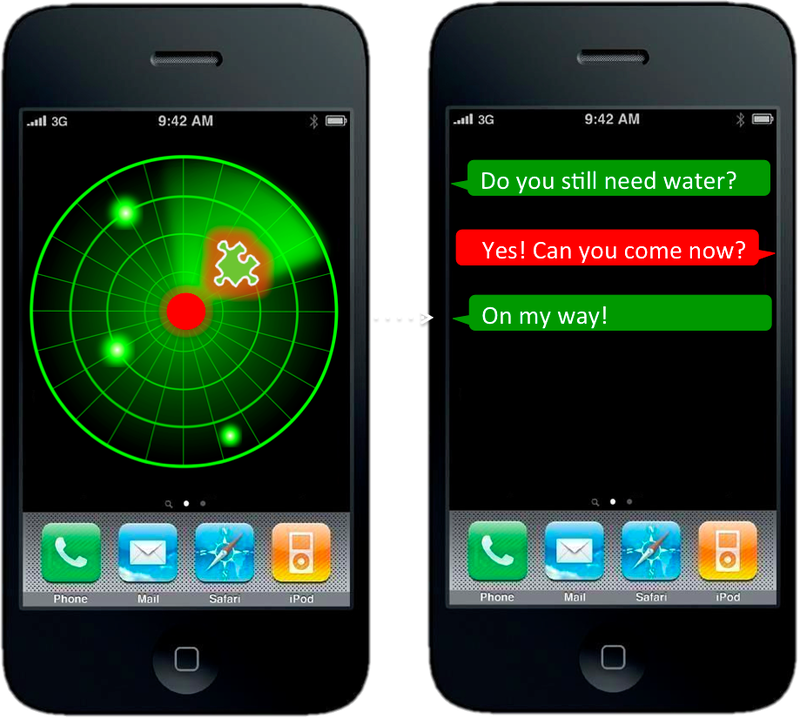 Disaster response apps have multiplied in recent years. I’ve been reviewing the most promising ones and have found that many cater to professional responders and organizations. While empowering paid professionals is a must, there has been little focus on empowering the real first responders, i.e., the disaster-affected communities themselves. To this end, there is always a dramatic mismatch in demand for responder services versus supply, which is why crises are brutal audits for humanitarian organizations. Take this Red Cross survey, which found that 74% of people who post a need on social media during a disaster expect a response within an hour. But paid responders cannot be everywhere at the same time during a disaster. The response needs to be decentralized and crowdsourced. In contrast to paid responders, the crowd is always there. And most survivals following a disaster are thanks to local volunteers and resources, not external aid or relief. This explains why FEMA Administrator Craig Fugate has called on the public to become a member of the team. Decentralization is probably the only way for emergency response organizations to improve their disaster audits. As many seasoned humanitarian colleagues of mine have noted over the years, the majority of needs that materialize during (and after) a disaster do not require the attention of paid disaster responders with an advanced degree in humanitarian relief and 10 years of experience in Haiti. We are not all affected in the same way when disaster strikes, and those less affected are often very motivated and capable at responding to the basic needs of those around them. After all, the real first responders are—and have always been—the local communities themselves, not the Search and Rescue Team sthat parachutes in 36 hours later. In other words, local self-organized action is a natural response to disasters. Facilitated by social capital, self-organized action can accelerate both response & recovery. A resilient community is therefore one with ample capacity for self-organization. To be sure, if a neighborhood can rapidly identify local needs and quickly match these with available resources, they’ll rebound more quickly than those areas with less capacity for self-organized action. The process is a bit like building a large jigsaw puzzle, with some pieces standing for needs and others for resources. Unlike an actual jigsaw puzzle, however, there can be hundreds of thousands of pieces and very limited time to put them together correctly. This explains why I’ve long been calling for a check-in & match.com smartphone app for local collective disaster response. The talk I gave (above) at Where 2.0 in 2011 highlights this further as do the blog posts below. This “MatchApp” could rapidly match hyper local needs with resources (material & informational) available locally or regionally. Check-in’s (think Foursquare) can provide an invaluable function during disasters. We’re all familiar with the command “In case of emergency break glass,” but what if: “In case of emergency, then check-in”? Checking-in is space- and time-dependent. By checking in, I announce that I am at a given location at a specific time with a certain need (red button). This means that information relevant to my location, time, user-profile (and even vital statistics) can be customized and automatically pushed to my MatchApp in real-time. 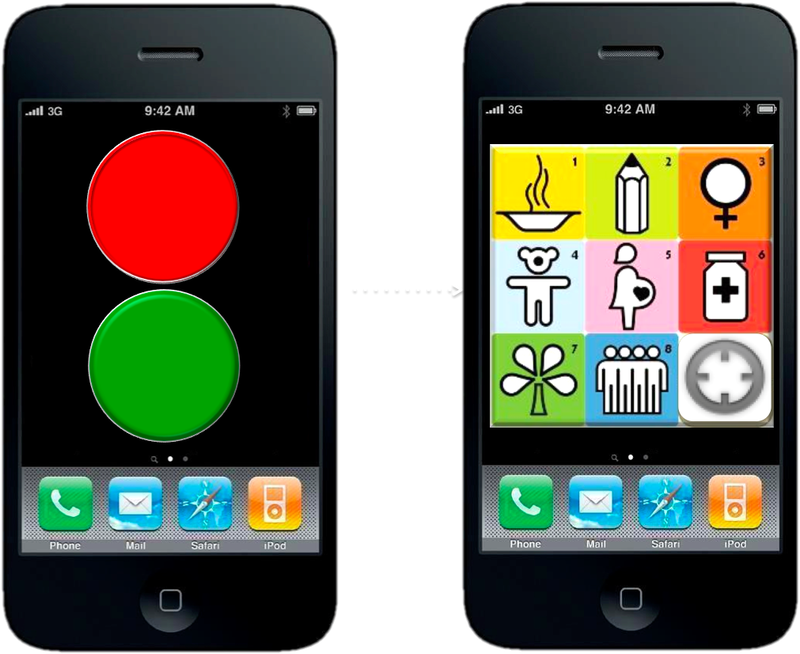 After tapping on red, MatchApp prompts the user to select what specific need s/he has. (Yes, the icons I’m using are from the MDGs and just placeholders). But MatchApp will also enable users who are less (or not) affected by a disaster to check-in and offer help (by tapping the green button). This is where the match-making algorithm comes to play. There are various (compatible options) in this respect. The first, and simplest, is to use a greedy algorithm. This algorithm select the very first match available (which may not be the most optimal one in terms of location). A more sophisticated approach is to optimize for the best possible match (which is a non-trivial challenge in advanced computing). As I’m a big fan of Means of Exchange, which I have blogged about here, MatchApp would also enable the exchange of goods via bartering–a mobile eBay for mutual-help during disasters. Once a match is made, the two individuals in question receive an automated alert notifying them about the match. By default, both users’ identities and exact locations are kept confidential while they initiate contact via the app’s instant messaging (IM) feature. Each user can decide to reveal their identity/location at any time. The IM feature thus enables users to confirm that the match is indeed correct and/or still current. It is then up to the user requesting help to share her or his location if they feel comfortable doing so. Once the match has been responded to, the user who received help is invited to rate the individual who offered help (and vice versa, just like the Uber app, depicted on the left below). As a next generation disaster response app, MatchApp would include a number of additional data entry features. For example, users could upload geo-tagged pictures and video footage (often useful for damage assessments). 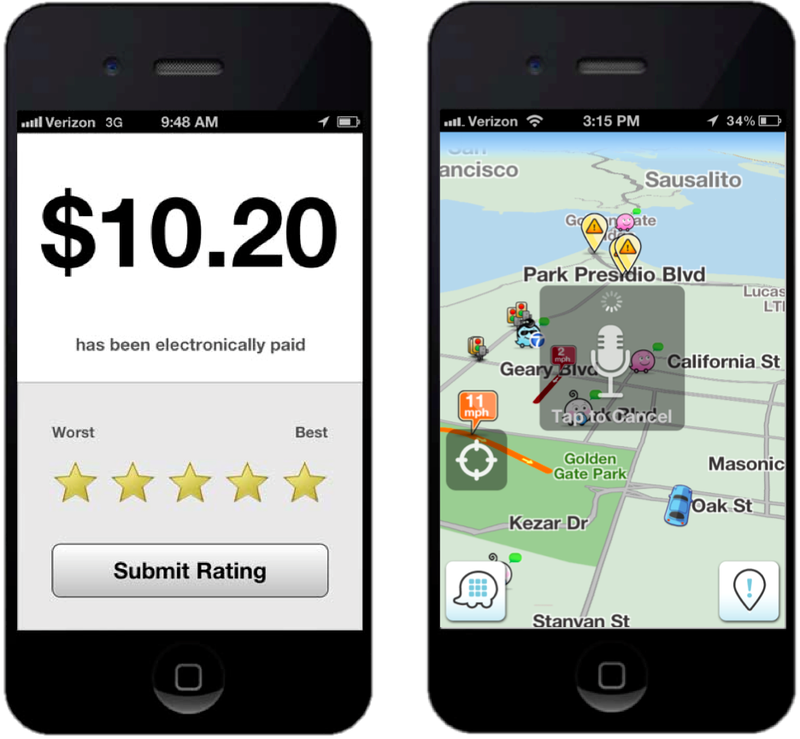 In terms of data consumption and user-interface design, MatchApp would be modeled along the lines of the Waze crowdsourcing app (depicted on the right above) and thus designed to work mostly “hands-free” thanks to a voice-based interface. (It would also automatically sync up with Google Glasses). In terms of verifying check-in’s and content submitted via MatchApp, I’m a big fan of InformaCam and would thus integrate the latter’s meta-data verification features into MatchApp: “the user’s current GPS coordinates, altitude, compass bearing, light meter readings, the signatures of neighboring devices, cell towers, and wifi networks; and serves to shed light on the exact circumstances and contexts under which the digital image was taken.” I’ve also long been interested in peer-to-peer meshed mobile communication solutions and would thus want to see an integration with the Splinternet app, perhaps. This would do away with the need for using cell phone towers should these be damaged following a disaster. Finally, MatchApp would include an agile dispatch-and-coordination feature to allow “Super Users” to connect and coordinate multiple volunteers at one time in response to one or more needs. In conclusion, privacy and security are a central issue for all smartphone apps that share the features described above. This explains why reviewing the security solutions implemented by multiple dating websites (especially those dating services with a strong mobile component like the actual Match.com app) is paramount. In addition, reviewing security measures taken by Couchsurfing, AirBnB and online classified adds such as Craig’s List is a must. There is also an important role for policy to play here: users who submit false misinformation to MatchApp could be held accountable and prosecuted. Finally, MatchApp would be free and open source, with a hyper-customizable, drag-and-drop front- and back-end.